Today, it seems hard to imagine a time when central bankers were more involved meddling in the markets. It seems hard to imagine a time when investors would be more likely to question their faith in these central bankers. Perhaps it is time to revisit the bullish case for gold. I really like that quote. It elegantly explains why gold has value to investors. I’ll get to who the big brain is behind the quote in a minute, and why we should be paying close attention to what he is saying today. If you follow the financial news very closely, chances are that you picked up on the fact that the central bank of Switzerland recently sent a shock wave through the world’s currency markets. The cause of the excitement was the Swiss central bank announcing that it was removing the longstanding cap that it had put on the Swiss franc relative to the euro. For the currency markets, that isn’t a little move — it is an earthquake, the repercussions of which were felt all across the financial markets in unexpected ways. 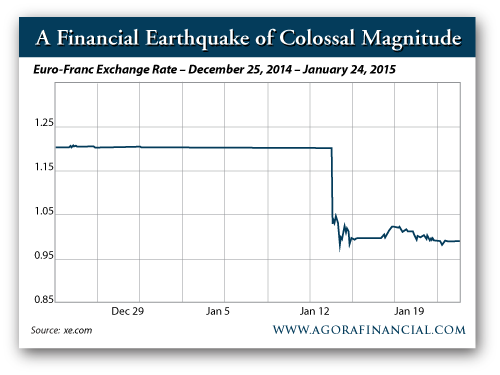 One unexpected consequence of this big currency swing hit somewhat close to home for me. I have a friend who up until recently worked for a very successful hedge fund called Everest Capital. About 10 years ago, the offices of this fund were actually directly above where I was working. As I was perusing the financial news shortly after the Swiss central bank move, I couldn’t believe my eyes when I stumbled onto this article. The article detailed how Everest Capital’s main fund was being forced to close because of losses incurred on the wild swings of the Swiss franc. This fund that was forced to liquidate was not a fund run by managers who are wet behind the ears. This particular fund had earned 12.3% per year since it was started 24 years ago, in 1991. Imagine that. Twenty-four years of hard work and excellent results gone in an instant on the decision of one central banker. I’m not suggesting that the Swiss central bank is at fault for Everest’s demise, but I am saying that the actions of a central bank caused a financial move that was so far outside of a successful sophisticated hedge fund’s financial models that it ruined the fund. When central banks meddle, unexpected things happen. If you really think about it, the Swiss central bank was actually forced into this decision by another central bank. With a massive quantitative easing program about to be rolled out by the European Central Bank, the ability of the Swiss central bank to continue to hold down its currency against the euro was about to be greatly compromised. The Swiss had to move, and they had to move quickly. Everest was far from the only party suffering big losses from this massive currency swing. Citigroup and Deutsche Bank both lost $150 million, Interactive Brokers lost $125 million and the brokerage FXCM needed a $300 million bailout from Leucadia. Again, when central bankers meddle, unexpected things happen. With each passing month, the amount of meddling increases. I don’t think anyone (especially the central bankers) knows what the ultimate consequences of that meddling may be. There was someone (actually, a few people) who predicted that the Swiss central bank would have to do this. One of those someones with an accurate crystal ball was the same someone who provided us with the quote at the top of this letter. I’m referring to Jim Grant of Grant’s Interest Rate Observer. Grant was on record months ago predicting that the Swiss central bank would have to release its peg on the franc/euro exchange rate. Not only that, but he told people how to profit from it. Holders of those call options recommended by Grant scored windfall profits within minutes of the peg being removed. The Swiss franc has long been viewed as one of the safe haven places where you could “store” value. What investors are looking for in a safe haven store of value is a lack of volatility. A safe haven is meant to be predictable. When you put your money into a safe haven, you know that you can expect to be able to take the same amount of money out. A safe haven is meant to be a calm port during stormy seas. The Swiss franc moved nearly 30% in a couple of hours against the euro. That is not the kind of volatility that investors are looking for in a safe haven. A 30% move (even in your favor) is unsettling when all that you are looking for is predictable behavior. Having your safe haven store of value fluctuate by 30% in a couple of minutes is like parents who turn their kids over to Mary Poppins to babysit only to come home and find that the babysitter was actually Charlie Sheen. If you don’t feel a currency that moves so violently that it ruins entire firms in minutes to be calm enough, what are your other best options? The other traditional safe haven places to store value in addition to the Swiss franc are U.S. Treasury bonds and the Japanese yen. It has been hard to argue with the strength of the U.S. dollar these days. But didn’t we just complete a quantitative easing program that created exponential bloating of our country’s balance sheet? And am I the only one who is a little bit nervous about the fact that Treasury yields are still next to nothing. I know people have been saying that for years, but at some time, doesn’t all of this easy-money policy start to come home to roost? Personally, I view Treasuries more as “return-free risk” than “risk-free return.” As long as everyone perceives them as safe, things will be fine. If people start thinking about things, that perception could change very quickly. And the yen? Are you kidding? That safe haven ship has sailed. Japan’s debt level stands at 150% of GDP, and 25% of their tax revenues are required to pay the annual interest on their bonds. And that 25% is at basically nonexistent interest rates, I should note. The yen is the opposite of a safe haven, which is why you see hedge fund managers like Kyle Bass shorting it. Bass has said that Japan is already technically insolvent. It is hard to imagine that there has been a time in recent memory that investors would be more inclined to consider owning gold. Jim Grant is also very bullish on gold. With his track record for making prescient financial calls, I think we should consider what he is saying carefully. Calling the Swiss central bank move is far from Grant’s only major documented success. I have some additional examples. As early as 2005, Grant was telling his readers that shorting the securitized lending market (think: subprime) was going to be a great bet, and at the very least that they should avoid exposure to it. Today, and for a while now, Grant has been bullish on gold. He unabashedly believes that the giant financial experiment that the world’s central bankers have been unleashing is going to end badly. When it does, Grant believes that the virtues of gold will become readily apparent to many. A way to get exposure to gold that I like, and which I have seen Grant recommend previously (in Barron’s), is the Tocqueville Gold Fund (TGLDX), which has been managed by John Hathaway since the 1990s. 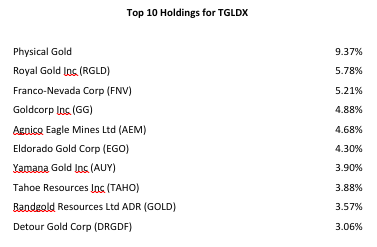 The fund holds both gold directly and select mining stocks that Hathaway believes are undervalued. Take a look…. Best of all, over time, he has significantly outperformed the XAU (gold index). In a world of central bank mischief, this fund represents a welcome safe haven — not to mention a way to follow Grant’s prescient advice. Gold doesn’t pay a dividend and you can’t use it as fuel to drive your car. 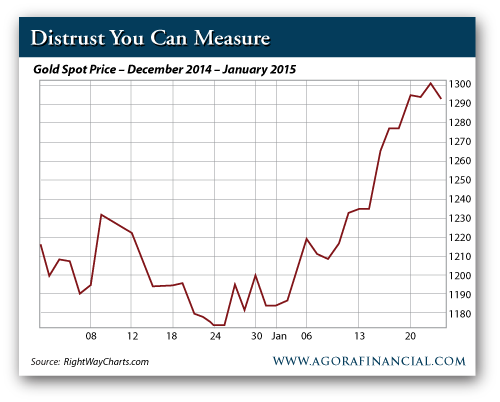 But gold has always been the choice as a store of value when the soundness of currencies is of real concern. 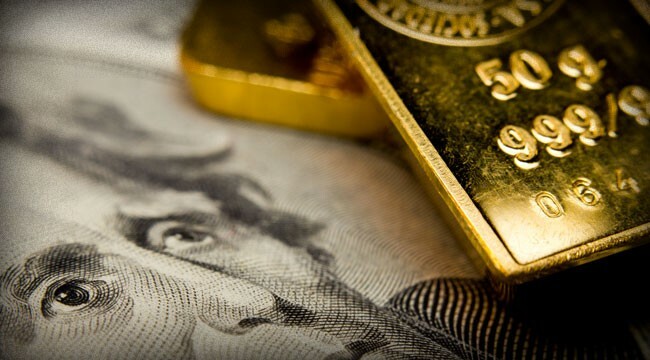 It is hard to imagine with a full-fledged global currency war underway and central banks with their thumbs in every pie how the popularity of gold is not going to continue to increase in the near future. Now’s the time to heed Grant’s advice.